The market for business intelligence (BI) and analytics platforms is one of the fastest growing software markets and will remain so for the foreseeable future according to technology analyst firm Gartner, with growth predicted at 7% (CAGR) through to 2017. 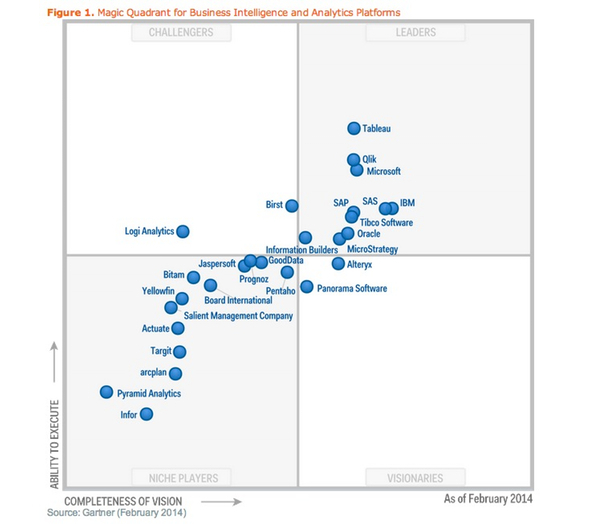 This week the firm has released the 2014 version of its Magic Quadrant report for business intelligence and analytics platforms. The report’s authors write that data discovery tools are dominating new purchasing requirements, but that no single vendor has solved the challenge of meeting the dual demands of enterprise IT and business users – a concept referred to as ‘governed data discovery’. 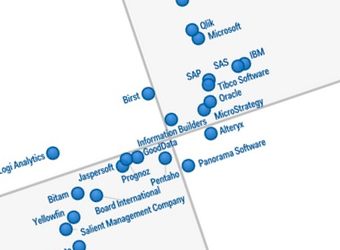 Leaders: “Leaders are vendors that are strong in the breadth and depth of their BI platform capabilities, and can deliver on enterprise-wide implementations that support a broad BI strategy,” Gartner explains. Vendors are evaluated based on their ability to execute and their completeness of vision. ‘Ability to execute’ includes the criteria: product or service; overall viability; sales execution/pricing; market responsiveness/record; and, customer experience. Completeness of vision includes the criteria: market understanding; marketing strategy; sales strategy; product strategy; vertical/industry strategy; innovation; and, geographic strategy. each had to receive a minimum of 30 survey responses from customers that use its platform in a production environment.